Pop quiz: What food is packed with vitamins and fiber, but is almost always purchased just to be thrown away? If you said banana peels, you’re right. It might be one of the world’s most recognizable comedy props, but the humble banana peel is nothing to laugh at. These slippery skins contain vitamins B6 and B12, magnesium, potassium and fiber, as well as tryptophan, which has been shown to help balance emotions and mood. While the jury is still out on exactly how much of these nutrients our bodies can absorb from eating banana peels, noshing on them instead of trashing them is still a great idea because of the landfill waste it saves. But if the idea of chomping down on these thick, fibrous membranes doesn’t sound very a-PEEL-ing to you, read on to check out the newest episode of Inhabitat and NYC Media‘s TV series Urban Green for three delicious and nutritious ways to make them more palatable. 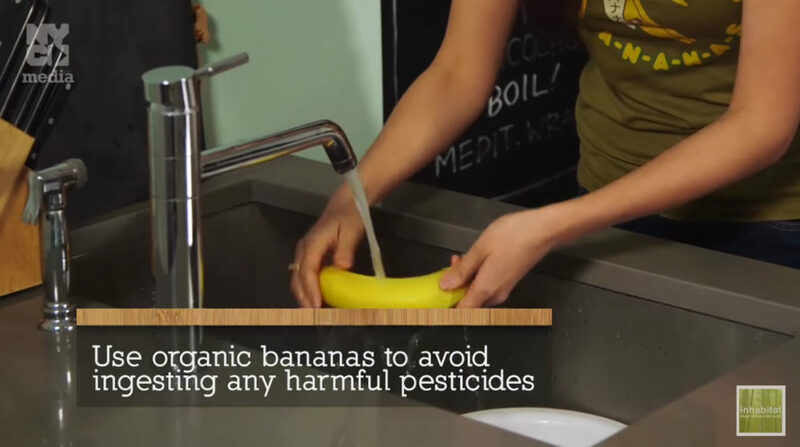 TIP 1: Remember to wash your banana peel thoroughly just like you would with any other fruit you plan to ingest. TIP 2: We recommend using organic bananas for these recipes since non-organic banana peels may contain harmful pesticides. Smoothies are a great way to mask the bitter flavor of banana peels while also breaking them down and making them easier to digest. One of my favorite smoothies to use banana peels in is an apple pie smoothie, which, believe it or not, tastes like a healthier version of apple pie. To make it, just blend one Red Delicious apple, one whole banana and the peel (just cut off the hard ends), a dollop of almond butter or a handful of almonds, some almond milk and a dash of cinnamon. If you’re allergic to nuts, feel free to leave out the almonds and use a different kind of milk. Peter Piper picked a peck of pickled peels, and so can you, with this couldn’t-be-easier pickled banana peel recipe. Just chop your washed peels up intro strips width-wise (cutting against the grain helps to decrease the fibrous mouthfeel). Then plan to have pickles for lunch so that you can use the leftover pickling liquid for your peels. 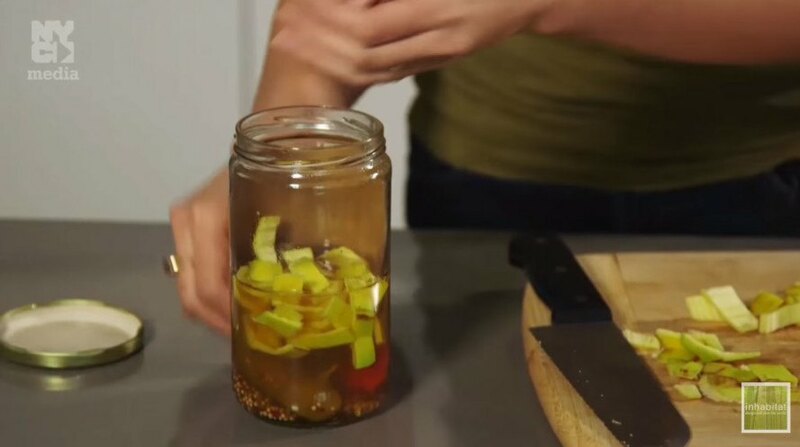 Submerge the peels in the pickling liquid overnight and you’ll end up with a tart condiment that will have your dinner guests trying to place the unique flavor. Okay, so candying isn’t exactly the healthiest way to eat banana peels, but these sweet morsels are guilt-free enough if eaten in moderation or used as a garnish. To make these crunchy treats, stir together ½ cup of sugar and ½ cup of water in a saucepan and bring to a boil. Then add 2 sliced up (again, against the grain) banana peels and reduce to medium/low heat. Simmer while stirring for about 10 minutes. Once you see the sugar begin to caramelize, remove the pot from the heat and transfer your peels to a baking sheet lined with parchment paper or other non-stick surface. Let your peels cool and harden, and then snap them into strips to eat as a snack or sprinkle over some yogurt to give it a crunchy kick. We hope you had a “bunch” of fun learning how to eat banana peels. And if you have any cool peel recipes, please share them in the comments below! Dear Yuka, nice article and advice, but we can eat banana peels only when we are sure that it 100% organic., otherwise we will consume chemical and poison, because big amount of pesticides were penetrates in skin only. Stop throwing away banana peels and eat them instead! Pop quiz: What food is packed with vitamins and fiber, but is almost always purchased just to be thrown away? If you said banana peels, you’re right. It might be one of the world’s most recognizable comedy props, but the humble banana peel is nothing to laugh at. These slippery skins contain vitamins B6 and B12, magnesium, potassium and fiber, as well as tryptophan, which has been shown to help balance emotions and mood. While the jury is still out on exactly how much of these nutrients our bodies can absorb from eating banana peels, noshing on them instead of trashing them is still a great idea because of the landfill waste it saves. 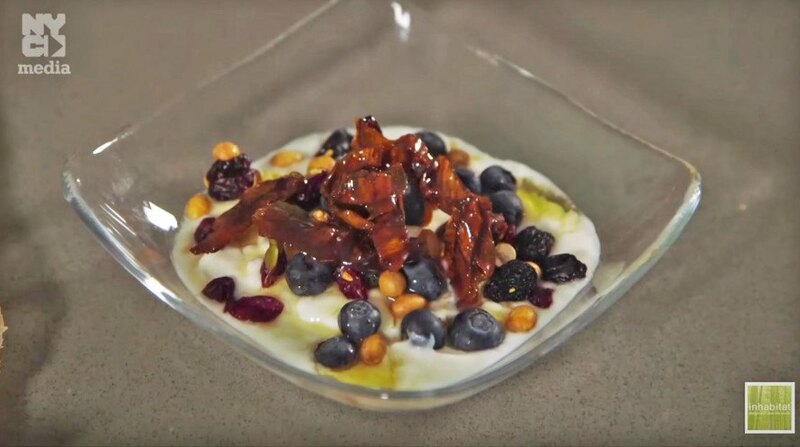 But if the idea of chomping down on these thick, fibrous membranes doesn’t sound very a-PEEL-ing to you, read on to check out the newest episode of Inhabitat and NYC Media's TV series Urban Green for three delicious and nutritious ways to make them more palatable. Stop tossing your banana peels - eat them instead! Before we get into our banana peel recipes, here are two important tips: TIP 1: Remember to wash your banana peel thoroughly just like you would with any other fruit you plan to ingest. TIP 2: We recommend using organic bananas for these recipes since non-organic banana peels may contain harmful pesticides. 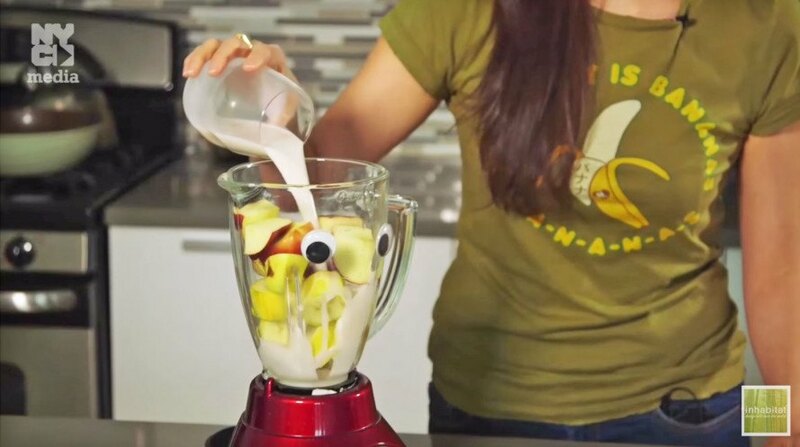 Smoothies are a great way to mask the bitter flavor of banana peels while also breaking them down and making them easier to digest. One of my favorite smoothies to use banana peels in is an apple pie smoothie, which, believe it or not, tastes like a healthier version of apple pie. To make it, just blend one Red Delicious apple, one whole banana and the peel (just cut off the hard ends), a dollop of almond butter or a handful of almonds, some almond milk and a dash of cinnamon. If you're allergic to nuts, feel free to leave out the almonds and use a different kind of milk. Peter Piper picked a peck of pickled peels, and so can you, with this couldn’t-be-easier pickled banana peel recipe. Just chop your washed peels up intro strips width-wise (cutting against the grain helps to decrease the fibrous mouthfeel). Then plan to have pickles for lunch so that you can use the leftover pickling liquid for your peels. Submerge the peels in the pickling liquid overnight and you’ll end up with a tart condiment that will have your dinner guests trying to place the unique flavor. Okay, so candying isn’t exactly the healthiest way to eat banana peels, but these sweet morsels are guilt-free enough if eaten in moderation or used as a garnish. To make these crunchy treats, stir together ½ cup of sugar and ½ cup of water in a saucepan and bring to a boil. Then add 2 sliced up (again, against the grain) banana peels and reduce to medium/low heat. Simmer while stirring for about 10 minutes. Once you see the sugar begin to caramelize, remove the pot from the heat and transfer your peels to a baking sheet lined with parchment paper or other non-stick surface. Let your peels cool and harden, and then snap them into strips to eat as a snack or sprinkle over some yogurt to give it a crunchy kick. You can check out other episodes of Urban Green on NYC Media's Channel 25. Urban Green is hosted by Inhabitat editor-in-chief Jill Fehrenbacher.